To succeed with PPC, you’ll need to regularly review, analyze and optimize your client accounts. The ‘Account Health’ dashboard by Reportgarden makes it extremely easy to monitor your clients. This dashboard also provides you with a list of both ‘Best Performing’ and ‘Worst Performing’ clients, to help you prioritize your efforts. Reportgarden uses certain factors/criteria to arrive at this client performance order. ReportGarden uses color indicators (Green, Yellow & Red) to identify client account health. The best performing client is labelled as ‘Green’ and the worst performing as ‘Red’. Color indicator is the primary factor in deciding the order of client performance. 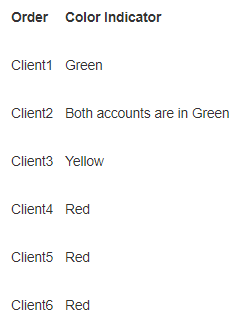 Example: If there are three clients and the account health of Client 1 is ‘Green’, that of Client 2 is ‘Red’ and Client 3 is ‘Yellow’ then the order of performance would be Client 1, Client 3 and Client 2. After the Color Indicator, it is the ‘Number of accounts’ associated with the client that decides the performance order of your clients. Example: Let’s assume that we have two clients, Client 1 and Client 2. 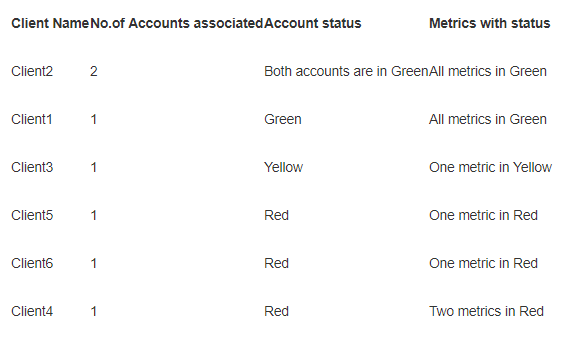 If Client 1 has two ‘Green’ accounts associated with him/her and Client 2 has only one ‘Green’ account associated with him/her, then Client-1 would be considered better performing than Client-2. Now assuming that two clients have similar account color indicators as well as the same number of accounts then the next factor which decides their performance is ‘ Deviation of metrics’. Note: At the foundational level, it is the performance of the account metrics which decide the account health. 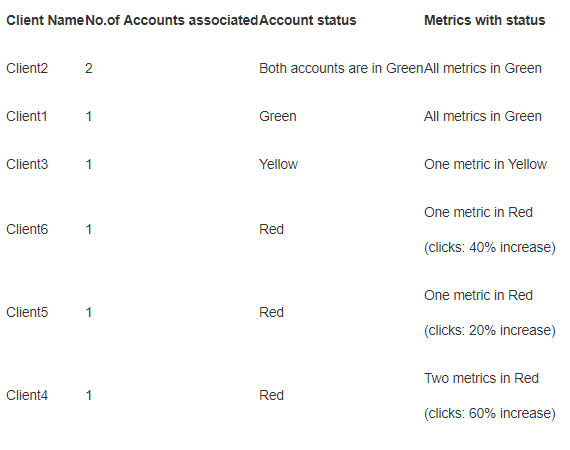 As is the case with accounts, ReportGarden uses color indicators to identify the performance of metrics. Good performing metrics are labelled as ‘Green’, average as ‘yellow’ and bad as ‘Red’. In the case where clients have similar values for the above three factors then their performance will be sorted on the basis of Clicks measure. A good case study will help you better understand these factors. Let's assume that we have 6 clients, client 1, client 2, client 3, client 4, client 5 and client 6. In order to find out the order of client performance, let’s apply the factors/criteria one-by-one. The client with ‘Green’ indicator wins, followed by the client in ‘Yellow’ and then ‘Red’. On applying this condition/criteria to the current case we arrive at the following performance order. Performance order of the clients after applying factor 1: client1, client2, client3, client4, client5, client6. 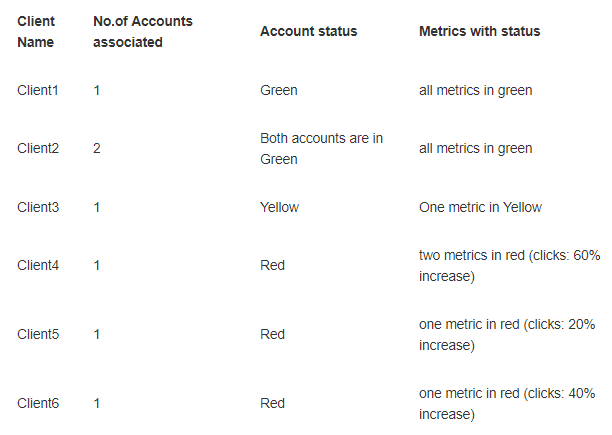 According to this condition, if two or more clients have the same color indicator then it is the ‘Number of accounts’ which decide the performance order. On applying rule, Client2 (with two ‘Green’ accounts) takes the top position, leaving the Client1 (with only one ‘Green’ account) behind. The rest of the order remains same. Performance order of the clients after applying factor 2: client2, client1, client3, client4, client5, client6. 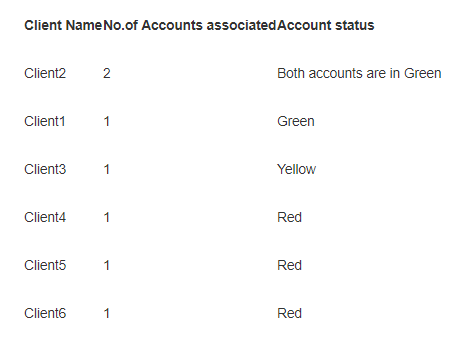 Reasoning: Client2 now occupies position 1 because it has two ‘Green’ accounts associated with it. Performance of individual metrics is the next big criteria in deciding the client position. Clients with better performing metrics rank higher than the rest. On applying this rule, Client 5 and Client 6, each with one metric in red, rank higher than Client 4 (2 metrics in red). Performance order of the clients after applying factor 3: client2, client1, client3, client5, client6, client4. Reasoning: Client4 moves down to the 6th position because of a two ‘Red’ metrics. Clicks measure is the last criteria in deciding the order of client performance. All criteria remaining same, it is the % increase in clicks which decide the performance order. On applying this criteria Client6 with 40% increase in clicks measure gains a higher position than Client5 (20% increase). Reasoning: Client6 moves up on Client5 because of a higher click measure.